Alu Dum / Potato simmered in spices and cream gravy is an exotic delicious dish with baby potato / normal potato. 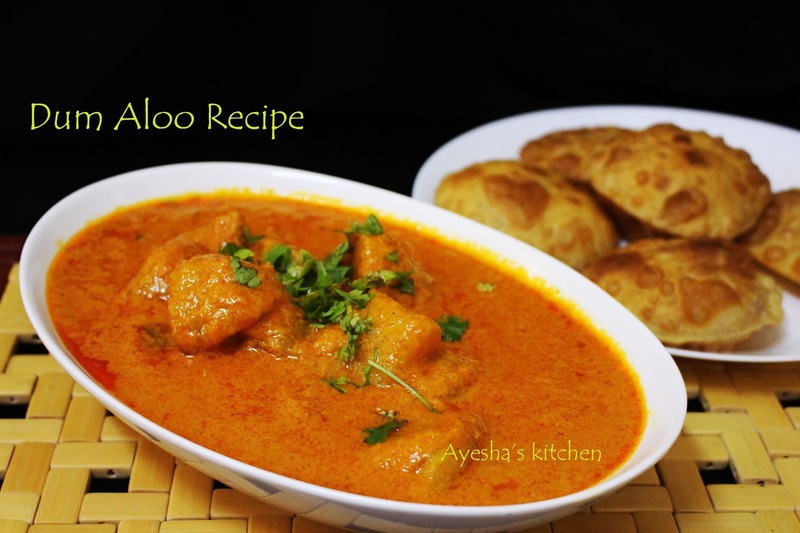 Dum aloo is a popular recipe cooked through out India. This dish belongs to Kashmiri Cuisine. Potatoes are an all time favorite. This versatile humble ingredient is used widely in almost all types of cuisines - from fries and cutlets to curries, bakes, and pies. The word potato comes from the Spanish word 'patata' . This eco - friendly crop is very easy tobe cooked in a number of ways to treat the taste buds. 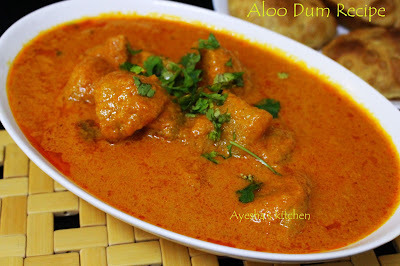 Dum Aloo curry recipe is mainly prepared with baby potatoes where it is deep fried and then cooked slowly at low flame in the spice and cream gravy. There are hundreds of ways to prepare this Alu dum. I prepared it with normal potatoes only where I pressure cook potatoes for one whistle, then unpeeled, sliced into 4 pieces each, shallow fried and finally simmered in spice gravy. A perfect dish for any dinner party which is creamy and spicy. The aroma of Aloo dum is an appetizing one. Hope you all try this All dish and enjoy. Here is the recipe showing how to make Aloo Dum / / easy potato recipes /spicy potato recipe/vegetable side dishes. Pressure cook the large potatoes or baby potatoes for 1 whistle along with water and salt. When done, drain the excess water. Once cooled, peel the skin. If it is large potatoes, after peeling slice each potato into four slices. Now heat a wok with few tbsp of oil and shallow fry the potatoes until lightly golden and set aside. Now add some more oil to the wok (if needed ). When hot, splutter cumin seeds and when done add the onion paste ( pureed onion using a blender). Saute till the water in the onion gets evaporated and the raw smell goes off. When done, add the ginger garlic fennel seed paste and tomato puree to it. Let it cook until the oil separates. When done, add the spice powder one by one along with some salt. Give a fine mix. When the gravy thickens, add curd and cream ( combine it well in a bowl) mixture to it. Add half a cup of water to it and let it boil. Finally, add the fried potatoes and reduce the flame to low. Let it cook well for 15 minutes with lid closed. Garnish with coriander leaves and serve hot with poori, chapati, paratha etc.